We have a wonderful selection of Colorado ranches for sale in and near Vail, Colorado! Perfect for the fishing enthusiast, Wolcott Colorado's masterpiece, the Rainbow Trout Lodge, graces 1.83 acres of sumptuous gardens, mature trees, dramatic red canyon walls, and stunning Eagle River frontage. Inside the luxurious 4,311 square foot interior, endless banks of Colorado Fraser logs, floor-to-ceiling windows, and a massive moss rock fireplace enhance the classic lodge fire lit settings. The kitchen boasts a large eat-in island and adjacent hearth room that features a handsome fireplace adorned with a hand-carved wood mantle. 2 master suites and 2 guest suites are each styled to enjoy the surrounding beauty of the striking river and red mountain cliffs. Read more about Colorado Ranches for Sale! Now for sale in Edwards, CO.? Look at this beautiful South Fork Meadows 4 bedroom home in an ideal setting on Lake Creek.? And only 1 mile from downtown Edwards and all of its restaurants, shops, boutiques and amenities.?? High end finishes combine with comfortable surroundings and a very functional floorplan for relaxed mountain living.? Entertaining is a pleasure; in the spacious kitchen, living, dining area; in the HUGE finished walk-out basement, on the deck over looking Lake Creek,?and on?the walk-out patio and back yard! We have incredible listings throughout the Vail Valley that boast incredible locations on the Eagle River, Gore Creek, and Lake Creek! Read more about River Property! Creek Property! 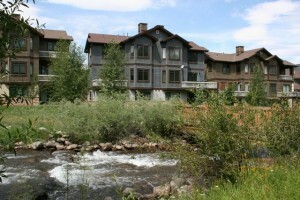 Riverfront Real Estate in the Vail Valley! Enjoy the sounds of the rushing water from your deck!? Fly fish from your own backyard!? Only a limited number of property owners have these luxuries?here in the Vail Valley, but these 2 homes could be yours.? And then you too could relax and enjoy your own mountain retreat. Located on the banks of Lake Creek, this 4 bedroom/4.5 bathroom duplex home is now for sale in Edwards, CO.? With high end finishes and great spaces throughout this 3 level home, comfort and convenience will be yours.? Situated just 1 mile from downtown Edwards and all of its amentities, and only minutes more to world class skiing.? Residents of South Fork Meadows, a truly wonderful community of duplex homes, will also enjoy the private fishing rights and the great 5 acre family park. Read more about Riverfront Real Estate in the Vail Valley! This ranch affords blissful tranquility from amid 35.5 acres. Spectacular and rare, this land is located within a gated community alongside the stunning Eagle River. With more than 850 feet of river frontage and gold medal fishing, this magnificent setting is a chance in a lifetime to own. Zoned resource for a single family residence and detached caretakers.